Have you seen our ads in the Daily Trojan? This one was in the lifestyle section on Thursday January 28th, 2010. The response was insane, it almost incited a riot. If newspapers are dying, nobody told the Daily Trojan. 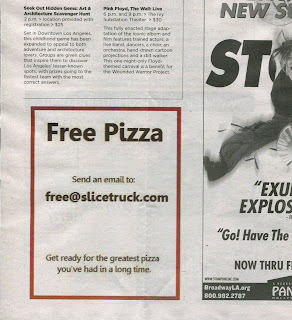 Offer still stands from the ad, email free@slicetruck.com for free pizza. Lilo probably got a slice due to this ad, not necessarily from SliceTruck but she probably got some pizza in response to this SliceTruck ad. She doesn't need free pizza, celebrities get everything for free. I'm not convinced that's not a SliceTruck pizza slice either. More ads coming this week. Stay tuned to the Daily Trojan for our ads. Yes, its going to be a very big week for the Daily Trojan.